Salvation And Survival: How Do I Love Like God Does? How Do I Love Like God Does? This is an introspective post, so bear with me as I invite you into a conversation I've been having with myself lately. I don't know if you are like me, but I have so many thoughts about the love of God. To begin, I am somewhat jealous when I hear people talking about experiencing the Father's love in their lives. I mean, I know He loves me; I recognize that He sent His Son to die in my place, and He loves all His creation, and I am a child of God [much beloved] for my faith in Jesus Christ. And I have had those moments of being spiritually overwhelmed with the emotion of His love. But it is not a constant experience. And I have to be honest, there are times when the two most important commandments Jesus declares -- to love the Lord God with all my heart, soul, and mind; and to love others as myself -- is sometimes hard to do. My flesh gets in the way. I want to be clear. Loving others is something I am certainly familiar with. I have been blessed with romantic love [Eros Love]. I know the love of family [Storge Love]. I know Philia Love, the powerful emotional bond of deep friendships. And loving God is not hard for me, by any means. But I yearn to love Him like He loves me -- without measure, perfectly, unconditionally, sacrificially, and purely. So I often question if I love Him as He deserves. I know that I have probably set unrealistic expectations and goals for myself. Yet, it is clear to me from Scripture just how important Love is. Jesus repeatedly tells us, "Love one another". 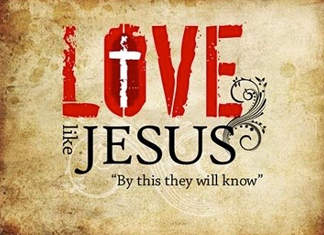 And the Apostle John's three epistles (1 John, 2 John, and 3 John) were written to take us deeper into loving Jesus, to love the Truth of God and cherish it in our hearts, and to show the love of God and His grace to all people. And then there's First Corinthians, Chapter 13, in which Paul expounds at length on the subject of Love. He writes that it should be the motivation of our lives [to get it perfect] until the moment we stand face-to-face with the Perfection of Love, Himself. When I take all of this into account, I wonder if I am capable of loving as much as God and Jesus desire me to. And then I hear other Christians saying everything always comes back to the love of God [I agree] and it is all that matters. They will say instead of disagreeing over doctrine, kingdom work, theology, etc. we just need to love each other. I agree that is the second greatest commandment we've been given, but I don't want to be casual about the other commandments Jesus told us to teach and follow either. In other words, I want to put everything in the right perspective, without sacrificing any of my Lord's divine instruction. So, I guess my real question is, do these Christians understand [and experience and practice] the depth of God's love better than I do, and are they able to walk it out in greater degrees and with more confidence than I do? Is Love meant to be as hard as it sometimes seems? After pondering this for several days, I think I found my answer in Scripture [which is the obvious place, right?]. And I found it in 2 Peter, Chapter One. There, the Apostle Peter tells me that there is a way for me to share in God's Divine Nature of Love and to partner with Him to achieve it. It begins with my faith in Jesus Christ. But to arrive at that pinnacle of loving like the Father does is a process. I cannot expect to just declare it and have it be so. Peter actually outlines the steps to get to that state of Perfect Love [or as perfect as it can be this side of Glory]. It begins by exercising my faith and then adding virtue [goodness, moral excellence] to my faith. Once I've got that step down, then I add knowledge [or insight and understanding[ to virtue. I believe that is the download God will begin to impart to you about Himself as you seek Him. Then you add self-control to that knowledge; the ability to control your emotions and behavior in difficult situations. After you have self-control down, the next step is to add patience and steadfastness [the ability to stand firm and unwavering]. To patience, you add godliness [growing more in the image of Christ]. To godliness, you add mercy [kindness, grace, and charity to others]. And finally, when you have spiritually matured through all these phases, you get to the final step, adding unending love. All these qualities increase in you until you are spiritually mature and able to walk in the Love of God. This passage almost seems like an unfolding climb up the ladder of faith, with loving like God loves being the top rung. And I believe Paul's treatise on Love in 1 Corinthians 13 backs this up. When he says that we now just see a faint reflection of the riddles and mysteries of God and our understanding is incomplete, I can identify! I don't have to understand or question my capacity to love, I just need to keep progressing up the ladder! One day I will perfectly understand His Perfect Love when I stand before Him. Until then, I have faith and hope, which are temporary. But they both originate in love, so if I have them, I have a portion of the Father's love, and I can grow it as I mature in my walk with Christ. I can now see that if we have Jesus in our heart as our Lord and Savior, His love will naturally emanate from us. I can't love like Him on my own. And I don't have to get it perfect now. Growing that love in my daily walk is an ongoing process, and I just need to rest in the knowledge that His love for me will transfer to others as I mature in my spiritual walk. Knowing that, I can find joy in the love I have for the Father [and His for love me] while I love others, expecting all that love to grow until I finally experience His Love in eternity. All I need to know is that I am progressing towards loving like my Savior, and I can love because He first loved me! 1 John 4:16 We have come to know [by personal observation and experience], and have believed [with deep, consistent faith] the love which God has for us. God is love, and the one who abides in love abides in God, and God abides continually in him.